Ashley Marie Vella-Zarb was born May 13, 2003. After an uneventful pregnancy and 2 ultrasounds which showed a normal healthy baby, it was a shock when Ashley was born and wheeled away without me holding her. The doctor came in and said she had a birth defect, but didn't know what it was. 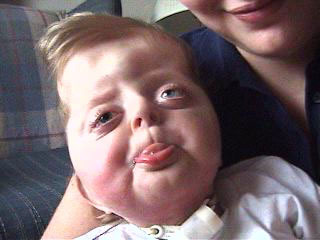 Once she was transferred to the NICU, I was told that she has Pfeiffer Syndrome with cloverleaf skull. 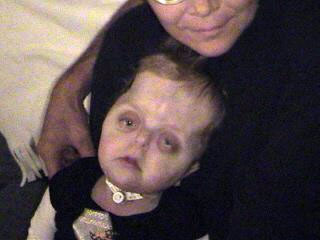 At 2 and a half months, Ash had her first cranial vault surgery. 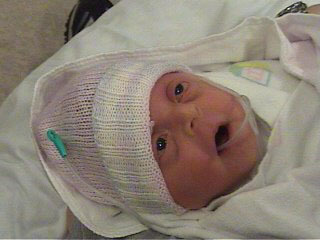 She's also had a shunt, feeding tube and trach put in. She's also had stitches put in the corner of her eyes and surgery to relieve pressure on her brainstem. So far she's had 7 surgeries and many more to come. But I know she's a strong little girl and will pull through it all. She's the light of my life and it doesn't matter how bad of a day I'm having, all I need is to see her sweet smile and it brightens my day. © 1997-2015 apert international, inc.
All photos and text are the property of the families represented and Apert International, Inc., and may not be used without their consent.